In 1913 a man cutting turf in Springmount bog in Ballyhutherland, Co. Antrim, found this set of six yew tablets, held together by leather straps. The inner tablets are hollowed out on both sides, forming the pages of a small wooden book. These inner surfaces are filled with wax, on which someone wrote, or rather literally inscribed with a pointed stylus, a biblical text. This is the earliest extant Irish manuscript. Someone, a monk or a scholar at a monastic school, has written onto the wax in a beautifully precise hand parts of Psalms 30 and 31 from the Old Testament. What is fascinating is that the style of writing is already a distinctively Irish form (‘Irish majuscule’), one which survived into modern times. In a manner typical of Irish culture, it combines elements of existing scripts in a new way. Literacy may be a cultural import from the post-Roman world, but from very early on it is being rooted in the local. There are later stories of wonderful manuscripts being written by sixth-century scribes and saints, and St Columba in particular is regularly described as ‘writing in his hut’. Another saint’s ‘life’ tells of a boy being sent ‘so that he might learn the science of letters’. Not all of this early writing was religious. Linguistic evidence suggests that the task of writing down the voluminous texts of Brehon law began around this time too, but none of those manuscripts survives. Literacy is not the same as learning. Reading and writing belonged to the new order of the Christian monasteries, but there was also an old order of learning in Ireland. The filidh (poets, savants and keepers of tribal lore) enjoyed enormous prestige and continued to assert their professional privileges. This is what makes early Irish literature so rich: the cross-fertilisation of the new Christian literacy with the old oral traditions of mythology and satire, lyric poetry and eulogies for local kings. As Celtic scholar Proinsias Mac Cana put it, ‘By the end of the sixth century, the church (that is to say the monasteries) and the filidh had come to terms and from that time on there is evidence of an ever-increasing practical co-operation and assimilation between them’. The result of this fusion is Western Europe’s first non-Classical vernacular literature. 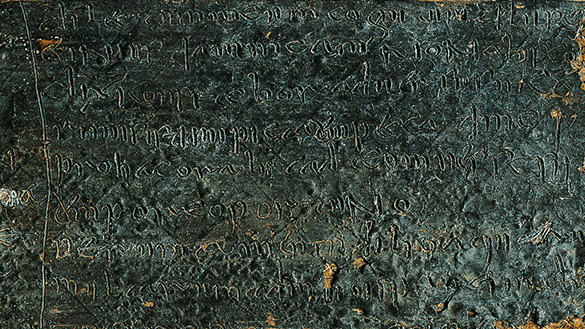 Monks wrote in Irish as well as in Latin, and they wrote down old pre-Christian stories as well as religious texts. The metres of Latin hymns and the habit of rhyming crept into Irish poetry. The demands of writing made for new, more direct styles of expression, more easily understood by lay people than the often baroque and self-consciously elitist learning of the filidh. Literacy did not, however, obliterate what had gone before: to an extent that is practically unique to Ireland, it gave it a new and much longer life.